Well I got an urge last night to try to get this exam out of the way. I was scoring well enough I thought on the NetMaster practice tests and was becoming concerned that I was just memorizing everything. I got some nerve up and registered for the test last night and took it at 9:00 am this morning. I scored in the 80’s which wasn’t bad. The material from Netmaster was very helpful and the Internetwork Expert COD’s with workbook one helped in understanding everything. I am just so glad this exam is out of the way for Labor Day weekend. Think I am going to take a week off and get my gear up and running and just relax. I want to thank the groupstudy guys and everyone who helped me through the site here. I am looking forward to no cabling, being able to load multiple configs with ease. With all the 3640’s at work and the equipment here I am starting to see the light as far as getting the lab hardware up and going. Running four switches is a lot easier than running nine more routers on top of them for the Internetwork Expert topologies. Alexandre from groupstudy has posted a MPLS tutorial up on his site. He is looking for overall comments. 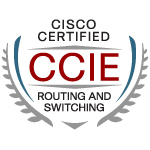 If you want to check it out I have his site added to the CCIE Blog’s list. I have been reading a post on Group Study from Scott on hooking up his Dynamips to real switches from his IMAC Mini. After reading his posts on this I thought I would try this out. I grabbed my 3550 in the basement and hooked it up to my Dynamips session in windows. I have two nics in my machine and connected the free one to the 3550 I got the network card information from the “network device” bat file and set the “fa 0/0 port =” to that nic information on my Dynamips config.Â I started up R1 and did a “no shut” on int fa0/0 and a minute later I was seeing the CDP information from the real switch. The possibility of being able to do all these labs without having to rewire, run 9 routers with backbones is very exciting. All I need now is two usb hubs and some usb ethernet converters to get this really running to test out with four switches. I probably won’t get too much studying in until Sunday. I have been going through the practice tests and lab book I from IE. The material is all starting to fall into place. Hopefully the written is on the horizon. ASA, FatPipe, T3, Oh My! We got a T3 line installed a few weeks ago to channel our MPLS traffic from our corporate office and all our outgoing internet traffic. The setup is kind of complicated and backwards. We have an ASA 5510 running that I upgraded from a PIX box. We have a device from FatPipeInc that pretty much multi homes us. Last but not least, we have a new 3845 with the T3 channel card for the new connection. Well our ISP engineer jumps on the router just to take a last look at our IP setups. With the T3 and the separation of traffic being split into sub-interfaces like in Frame-Relay they wanted to make sure we had the proper IP’s. Everything is setup correctly, IP’s are good. So I decide to double check the routing. Our default route normally would be to the ASA box to pipe all internet traffic. I use a few static routes to route traffic to the remote locations. The corporate office is the main hub for everything. So it hits me if I set the default route to the ASA Box, I will just create a routing loop. The problem of running one router for MPLS and internet traffic I guess. Internet traffic will come from the 3845 to the ASA box to the FatPipe and than to the 3845 again where it will send it back to the ASA box. Following me ? No, I lost myself as well. 3845 (not MPLS traffic) –> ASA 5510 –> FatPipe –> 3845 to go out the internet sub-interface. Then the solution just hit me, just use a route map on the 3845 telling it any traffic coming from the Fatpipe to set the Next Hop to the interface IP of the ISP router connected to our internet side of the T3 line. So I setup the route map quick and easy. We fire up the T3 line and just as I hoped, the internet traffic is going out the internet sub-interface and the MPLS traffic is going out the MPLS sub-interface. All because of a simple routing map….. Made life a little easier that day. “Takeaway: Network address translation (NAT) has become one of the key components of today’s corporate networks attached to the Internet. See how to set up and manage NAT using the Cisco Internetwork operating system. Network address translation (NAT) is one of those rare information technology buzzwords that does exactly what its name implies. In this case, it translates one network address into another network address. The most popular use for NAT is to connect an internal network to the Internet. The proliferation of hosts that now connects to the Internet is causing a shortage of IP addresses, so NAT is a key tool for connecting corporate networks using private IP addresses to the Internet. Since Cisco provides the bulk of the routers that connects to the Internet, weâ€™re going to show you how to set up NAT using the Cisco Internetwork Operating System (IOS). Use only one public, registered IP address for Internet access for many thousands of private IP addresses at your site. Change Internet service providers (ISPs) easily, without readdressing the majority of hosts on your network. Hide the identity of hosts on your local network behind the single public IP address to keep outside hosts from easily targeting them. Inside Localâ€”This is the local IP address of the private host on your network (i.e., your PCâ€™s IP address). Inside Globalâ€”This is the public, legal, registered IP address that the outside network sees as the IP address of your local host. Outside Localâ€”This is the local IP address from the private network, which your local host sees as the IP address of the remote host. Check out Amp’s quest for CCIE when you get a chance! Well since I had no rack time tonight to complete the switching labs in the workbook I fired up Dynamips. I was pretty impressed with how everything was running. My CPU usage was very low, I was seeing everything in the debugs I wanted to see. The labs were pretty basic, but they bring back a lot of the commands from deep within!Â I miss frame-relay, DLCI’s, and point-to-whatever! Brings me back to my first networking job and our nation-wide frame relay network. Things seemed so much simpler back then. I think tomorrow I will start working on the NetMasters written practice test I just purchased Friday. I really do hate practice tests, especially 100 questions at a time. It is really no fun. I will post tomorrow on how they went.